Spooky Halloween Village Escape info about the game-Games2Rule. 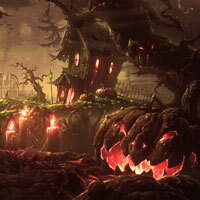 Spooky Halloween Village Escape is another new point and click room escape game from games2rule.com. In this game, you came to visit a spooky village for your Halloween party. But unfortunately you noticed that someone trapped you inside this spooky village. No one is there to help you. You have to escape from this mysterious forest by finding useful objects, hints and solving puzzle. Click on the objects to interact with them and solve simple puzzles. Good Luck Have Fun!